You've heard this before, right? I don't know who said it first, but it's a motivating statement (even if sweat isn't really, truly fat leaving the body)—particularly as it relates to living the fit life. And let's face it, when you live the fit life, you do a lot of sweating (like it or not). It's an accepted byproduct of hard work. And, unfortunately, hot weather. For some of us, that hot weather is becoming a true factor in our daily fitness regimes. We're getting outside more than ever because the sun itself is out, too. So maybe we're even sweating now more than ever. We're also shedding all those cold-weather clothes in favor of sleeveless shirts and short shorts. Why? Because we dare to be bare when the weather permits. But along with this exposure comes our need as humans to look and feel our best. So how do you do that when you're sweating your arse off and feeling less than clean and fresh? Let's count the ways. 1) Keep your hair pulled back. It isn't always the cleanest, especially when sweat is involved. And if your head is sweaty, your hair is certainly absorbing that sweat, so if it's hanging in your face—it's probably transferring all of that sweat to your face, too. Which, consequently, can clog pores and promote breakouts. But quite simply, pulling your hair back lets all that fresh air travel around your face and neck. I don't know about you, but that always feels good to me. 2) Wear sunscreen if you exercise outdoors. Seriously. Do it. Skin cancer rates are constantly rising. Don't be a statistic. Cover yourself like it's your job. Get a sweat-proof bottle, one with a noteworthy amount of SPF in it. You can run, but you can't hide from the sun. And then when you're not running anymore, you won't feel like a parched lobster. No one feels good when they look like a parched lobster, am I right? And don't even get me started on working out with a sunburn. Ouch. 3) Drink water. Lots of it. Water hydrates the body like no other liquid can. To hydrate the body is to promote good skin and functioning organs. Think of a plant and what happens to it if you don't water it. That's how the human body works, too. 4) Buy the right kind of clothing. And make sure it fits. Active people need clothing that promotes active movement. If the shoe doesn't fit...if the clothes don't fit...think chafing and blisters, burns and bumps. Otherwise known as "not fun" to the average human. And don't be afraid to buy clothing that shows off a little skin. Dare to be bare, right? I'd much rather work out in a tank top than a tee. I feel free to move as I please, not bogged down by a bulky tee that's soaked in sweat. 5) Develop a successful beauty routine. Might I suggest you try the new Clear Tone deodorant from Dove? I was recently given the opportunity to test out a few sticks, and since I've been purchasing the same stick of deodorant for years, I thought—be adventurous, Tara. Give it a go! So I did. And I liked both versions. As a certified personal trainer and group fitness instructor, it's safe to say that anti-perspirant and deodorant are both part of my daily routine. I wouldn't "dare" show my "bare" armpits without them. Not only would I feel gross, I'd probably be significantly smelly and sticky, too. Which is also why I've been so hesitant to switch deodorants. My current favorite works just fine, thank you. It's nice to know I can turn to this stuff, too. Added bonus? The Clear Tone aspect fights that dark shadow and those silly bumps you get from frequent shaving. 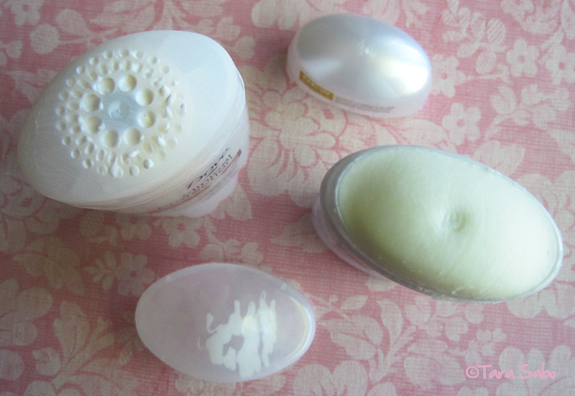 It's true, I noticed a small difference...but I have to say, I like the sheer touch more than the clinical protection. I prefer solids to twist-ups. But that's just me. FYI: If you want to try the above, visit the Dove website to snag a coupon! Question: How do you dare to be bare? 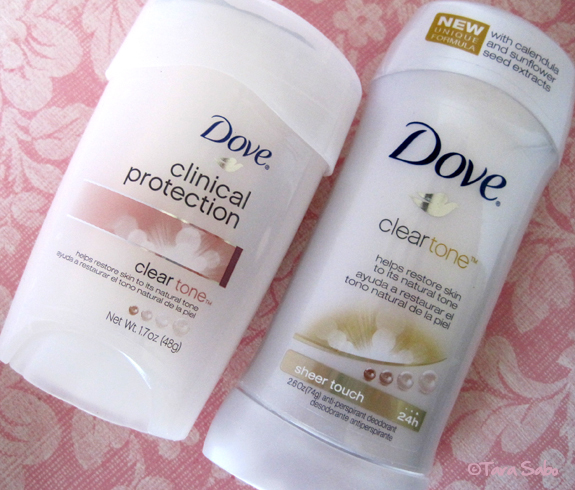 Note: As part of the DailyBuzz Healthy Living Program, I received free Clear Tone Deodorant and a stipend from Dove. However, my opinions are entirely my own.